Here’s a scoop that we stumbled across recently: Dreamworks Animation is not only hard at work on a sequel to 2010’s Ursa Major Award-winning film How to Train Your Dragon, but they are also working on a TV series to be aired on Cartoon Network beginning in late 2012. ScreenRant.com have been following the story closely, and they recently featured an article that includes an interview with executive producer Tim Johnson from BadTaste.it. 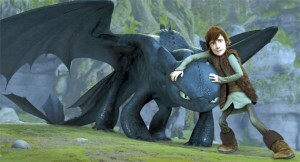 According to Mr. Johnson, How to Train Your Dragon 2 (the working title) will be released in the latter part of 2013. Dean Deblois, co-director of the original film, will this time serve as sole writer and director for the sequel. Original co-director Chris Sanders will be on as an executive producer, along with original producer Bonnie Arnold. Most of the original voice cast will return for the sequel, including Jay Baruchel, Craig Ferguson, America Ferrera, Jonah Hill, Christopher Mintz-Plasse, TJ Miller, and Kristen Wiig. It’s unclear right now if any of them will also be involved in the TV series. Also unclear at this point is what the plot of either the TV series or the sequel film will be like, although Tim Johnson has said that the TV series will likely be a bit more mature, perhaps even darker, than the current Dreamworks TV spin-off series, Kung Fu Panda: Legends of Awesomeness.